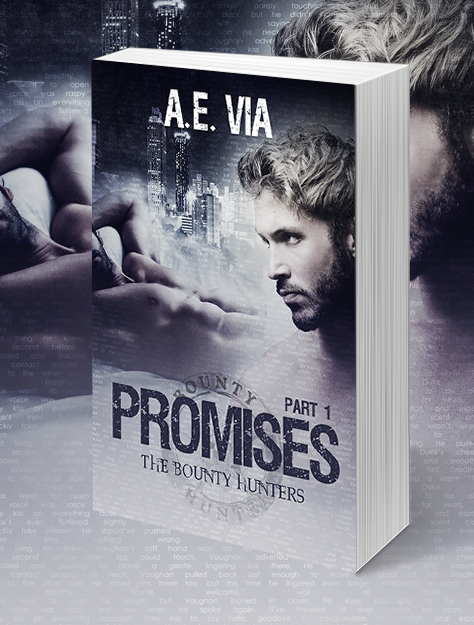 PROMO TOUR with GIVEAWAY: Promises by A.E. Via | Because two men are better than one! Duke Morgan owns and operates one of the largest bail bond companies in Atlanta. Not only does he bond criminals out of jail, he and his notorious group of bounty hunters will also track them down and ensure they show up for court. Roman ‘Quick’ Webb is Duke’s business partner and best friend. Both men are in their forties and have given up on the happily ever after with the ranch-style home, and white picket fence. They’d both tried it and failed miserably. But they have their friendship and they have the business. When Quick’s son, Vaughan Webb returns – after seven years – from studying abroad with his law degree in hand, he’s back to claim what he’s always wanted…his fathers’ best friend… Duke Morgan. Vaughan has always claimed to be a classic gentleman with an old soul. He didn’t party and screw up in school like his buddies. 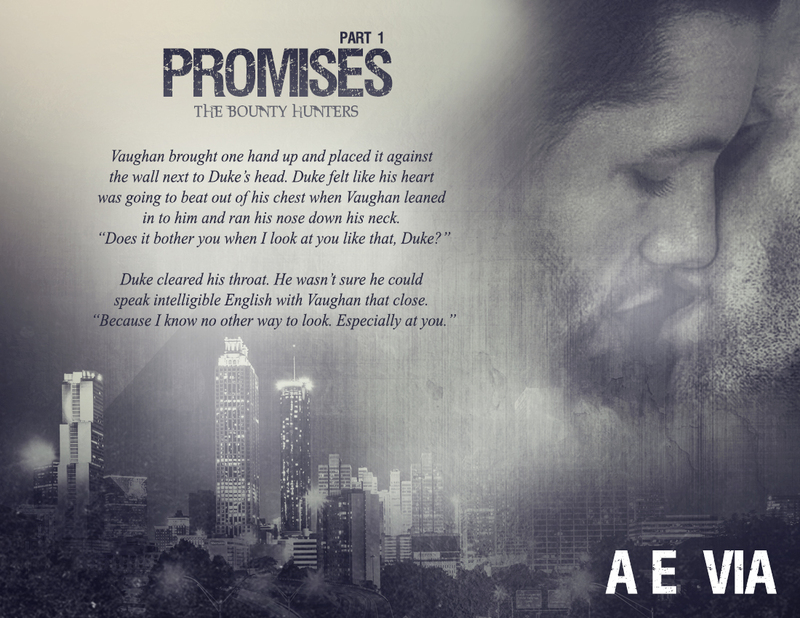 He was focused and dedicated to becoming the man worthy of Duke’s love. It’s a complex and messy situation as Duke and Quick figure out how to still be best friends when one of them is sleeping with his friend’s one and only son. But when Duke is hurt on the job, all the unimportant trivialities fall to the wayside and Vaughan and Quick put their heads together to save Duke. 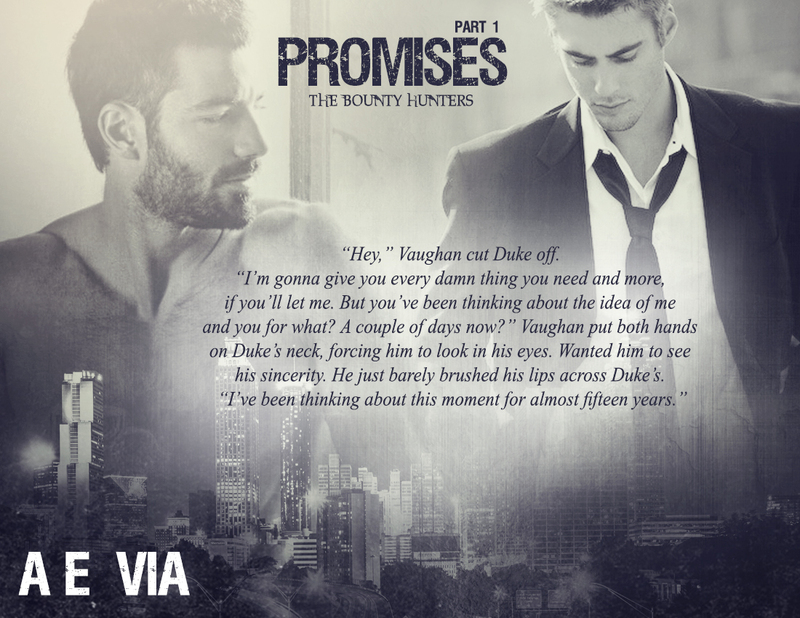 Part I of the Promises story is about Duke and Vaughan. Part II will be about Quick and his realization that it’s not too late for any of them to find love. While this is only her eighth novel, she has plenty more to come. So stalk her – she loves that – because the male on male action is just heating up!